This is a foreign exchange guide to Azerbaijan, the Azerbaijani Manat currency plus AZN transfers and travel tips. Azerbaijani Manat exchange rates - latest & historic exchange rates. What is the Azerbaijani Manat currency code and symbol? The three letter currency code for the Azerbaijani Manat is AZN. Which countries use the Azerbaijani Manat? It is the domestic currency in Azerbaijan. The interactive chart below shows the USD to AZN exchange rate for the previous 3 months with rate alerts for days when the exchange rate moved up or down significantly or for 30 day highs and lows. Selling itself as the 'Land of Fire', Azerbaijan (Azərbaycan) is a tangle of contradictions and contrasts. Neither Europe nor Asia, it's a nexus of ancient historical empires, but also a ‘new’ nation rapidly transforming itself with a super-charged gust of petro-spending. 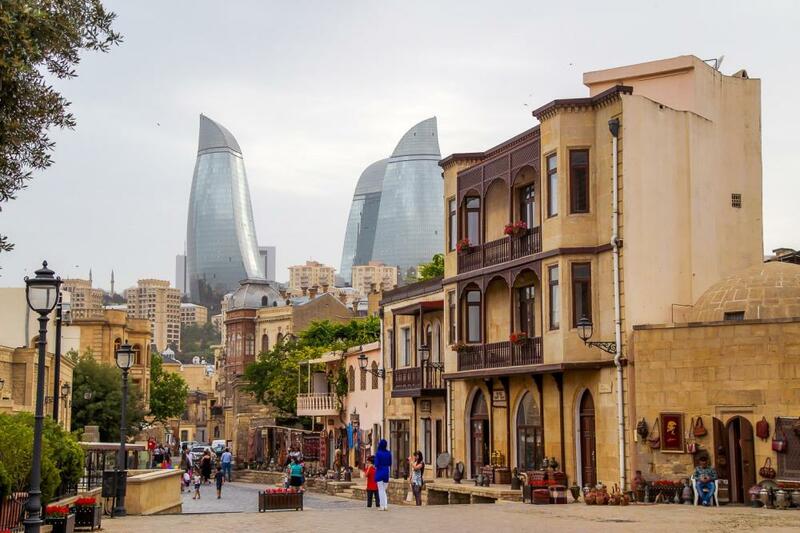 The cosmopolitan capital, Baku, rings a Unesco-listed ancient core with dazzling 21st-century architecture and sits on the oil-rich Caspian Sea. In the surrounding semi-desert are mud volcanoes and curious fire phenomena. Yet barely three hours’ drive away, timeless rural villages, clad in lush orchards and backed by the soaring Great Caucasus mountains are a dramatic contrast. The country was a well-known tourist spot in the 1980s. However, the fall of the Soviet Union, and the Nagorno-Karabakh War during the 1990s, damaged the tourist industry and the image of Azerbaijan as a tourist destination.It was not until the 2000s that the tourism industry began to recover, and the country has since experienced a high rate of growth in the number of tourist visits and overnight stays. 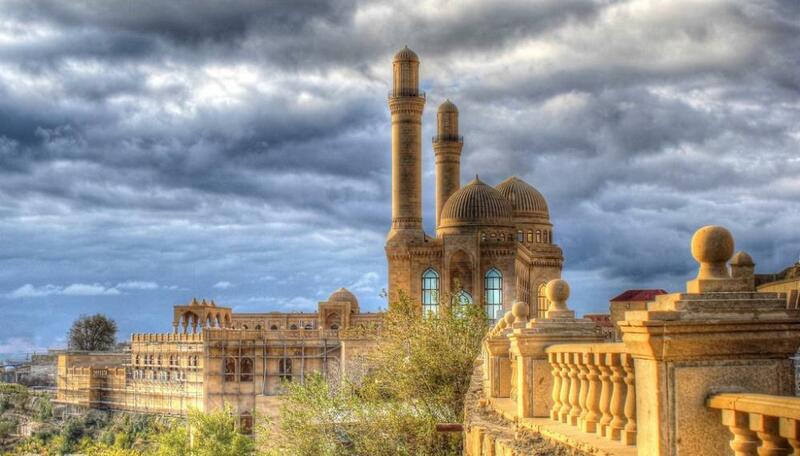 In the recent years, Azerbaijan has also becoming a popular destination for religious, spa, and health care tourism. During winter, the Shahdag Mountain Resort offers skiing with state of the art facilities. City of Baku with the iconic Flame Towers. What currency is used in Azerbaijan? Azerbaijan’s national currency is the Manat, divided into 100 gapiks (q) with coins available in 10q, 20q and more rarely 50q denominations. The manat is written with a M symbol that looks like the Euro € swivelled through 90 degrees. A large number of banks offer exchange services. Especially in central Baku you can find remarkably low buy-sell rate splits for Euros, Pounds, Roubles and especially US Dollar cash. Reconverting any extra mantas back to dollars or Euros is not problematic. Rates at hotels tend to be significantly poorer. Cash machines are widespread throughout central Baku and increasingly common all across Azerbaijan with at least one ATM in even the smallest regional centre.Few cities in the world are as safe as Baku. Petty crime is minimal. Locals with bulging wallets sticking out of a rear pocket seem blissfully unconcerned getting onto a packed full public bus. Temple in the capital city of Baku. The official language is Azerbaijani. By air, Baku has numerous connections to Europe and Central Asia, plus to China and Dubai. There are additional air links to Moscow from Lənkəran, Naxçivan and Gəncə. Direct international buses from Istanbul run three days a week to Baku (via Georgia and Gəncə) and six times daily to Naxçivan. Between Naxçivan and the rest of Azerbaijan you’ll need to fly, or transit Iran. All borders between Azerbaijan and Armenia are closed and seriously militarised. Similarly, Nagorno-Karabakh and the occupied areas are entirely inaccessible from the rest of Azerbaijan. How to get around in Azerbaijan and nearby cities? The capital Baku has a cheap, easy-to-use metro system. Other urban transport comprises a mixture of marshrutky and buses. Marshrutky will stop to pick up or drop off passengers anywhere along their routes, but they can get very crowded. Route boards are often in local script. Taxis are plentiful. Most in Yerevan and some in Baku are metered. For others, agree on the fare before you get in. A ride of 3km or so normally costs around US$2 in Tbilisi or Yerevan, US$3.50 in Baku if metered, much more unmetered. Baku has branches of major international car-rental companies as well as (usually cheaper) local outfits. Hiring a local driver for intercity trips or excursions is worth considering especially if you locate someone who makes the proposed route regularly as a shared taxi (ie he won't need you to pay for his return drive). You can often find such drivers around bus and train stations, though in some cities shared taxis have their own recognised waiting points. Hostels can also find you a driver at prices that can prove favourable to finding a taxi on the street (around US$0.30 per kilometre). Almost every town and village has some sort of bus or (more commonly) minibus service, the latter being known widely as a marshrutka (plural marshrutky). Services can run hourly between larger towns but rural villages often have just one single minibus that leaves for the regional centre in the morning then returns from the bazaar after lunch. 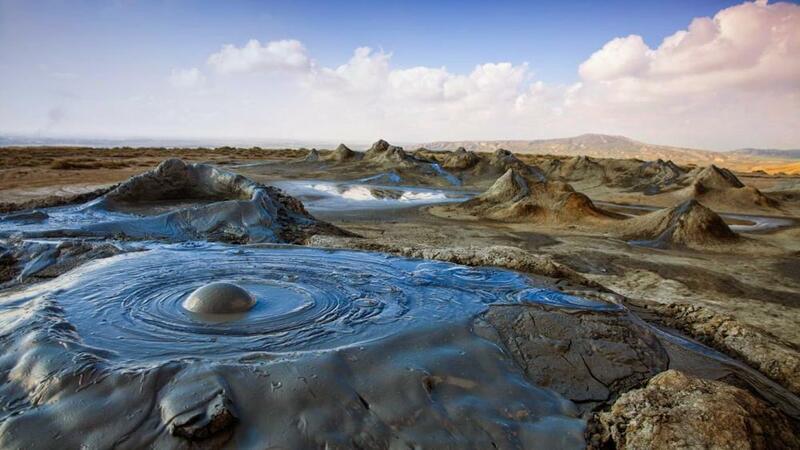 Azerbaijan has a number of live mud volcanoes. Save money and time by Ordering your Azerbaijani Manat online from Travelex, you get better rates and can pick up the AZN cash locally or even on travel day at the airport. For card purchases if offered a choice of currencies always select to Pay in Azerbaijani Manat otherwise you may get much worst exchange rates. Compare AZN travel cash rates - probably why you are here! When searching around for information on how to get a good exchange rate when sending money to Azerbaijan you need to start with finding out the latest Azerbaijani Manat foreign-transfer exchange rate. Once your funds are received by the provider the converted AZN amount will be transfered to the recipient account you specify in Azerbaijan. Use our Send to AZN calculator to compare the exchange rates of FX specialist providers rates versus your bank's standard rates you can hopefully save around 5% and maybe more - end result is more Azerbaijani Manat deposited into the recipient bank account and less margins and fees kept by the banks!